Director Krisstian de Lara was recently interviewed by Mind Warp, a studio site that highlights film festivals, upcoming projects and emerging local talent from the border community of El Paso, Texas and Juarez, Mexico. 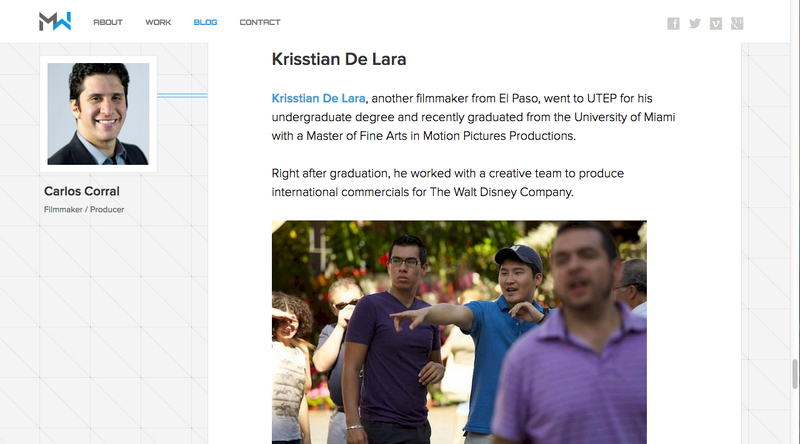 The article highlights Krisstian as a filmmaker on the rise among other local filmmakers. In the interview, Carlos Corral, Producer and filmmaker himself at Mind Wrap asks Krisstian questions such as what is it like to have Sub Rosa screen at the 2014 Plaza Classic Film Festival. Krisstian responds to the question: “I am thrilled that Sub Rosa was able to premiere in my hometown at the Plaza Classic Film Festival, a festival iconic for its…” click here to read more. Krisstian also answers questions such as what he hopes to achieve by pursuing higher education in film in Miami. Krisstian states, “I take one opportunity at a time but hope to one day create content with an international audience and tell stories that will make people laugh or cry and hopefully…” click here to read more. To read the complete article, “El Paso Film Scene Begins to Find Its Voice” click here.